The vocals are mainly death growls, but there are also the usual Viking “drunken” choirs. All the compositions are very interesting having a “happy” folk mood, that sometimes makes you wanna drink tons of beer and start dancing up and down! The sound reminds of bands like Finntroll and Trollfest, but they definitely have their own identity, something that made Napalm Records offer them a contract. 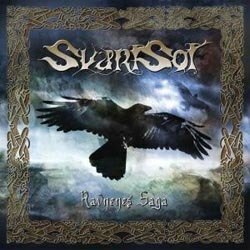 I am sure all the fans of this genre will adore Svartsot and their inspired “Ravnenes Saga”. If they manage to remain at this high level, or get even better in their future releases, then I believe their name will stay for many years in the folk metal scene. You can check on your own their official pages.